This lesson will discuss how to solve an equation with a variable on both sides. 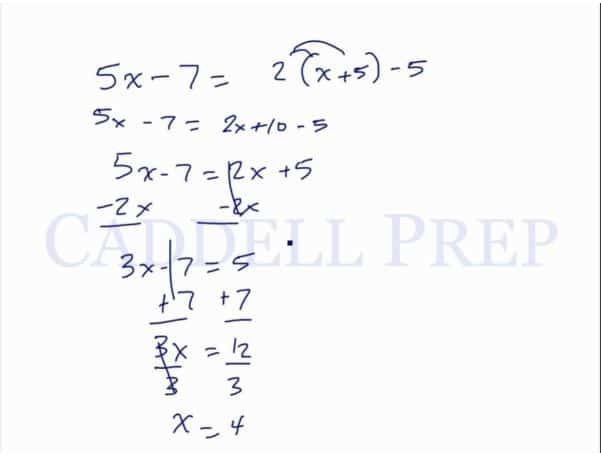 In this video, we will be learning how to solve for x (or another variable) in complex algebraic equations where x (or another variable) is present on both sides using inverse operations. Now, let’s solve an equation with a variable on both sides. This equation has on both sides. My advice is, if you can, get all the -term on one side only. It doesn’t matter which side – left or right. Here, we have a variable equation that needs solving. So, let’s start it over again and subtract from both sides of the equation. The same thing. We still have a variable equation that needs solving. So either way, even if you choose the left or right side, it’s up to you. Just follow the steps correctly and you will arrive at the correct answer. Since we have this equation now, let’s move on solving. Let’s isolate by subtracting on both sides. Now, let’s have a different example. So since we have to get all the -terms on one side, we have to simplify the equation on the right first because an equation is inside a parenthesis. Do this by distributing on each term inside the parenthesis. At this point, I choose to bring the to the left. Now, this is the normal equation we can solve. So let’s solve by adding to both sides of the equation. So as you can see, this is very similar to solving equations in multiple steps. The most important step is to get all the -terms on one side of the equation. Then follow the rules as you go.